Well, it has been snowing since Friday afternoon and shows no signs of letting up until tomorrow. 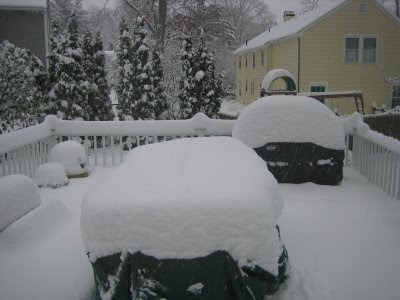 Here's another shot off our back deck for comparison to yesterday morning. This is certainly throwing a monkey wrench into last minute shopping and holiday parties- at least we're all home safely. Hope you're having a good weekend!